This paper is a follow up to, and complements, my paper published last year in Cuba in Transition—Volume 7 (Madrid-Aris, 1997), in the sense that better data have been collected, and some tests have been performed to find some explanations for the Cuban decreasing total factor productivity (TFP) growth. 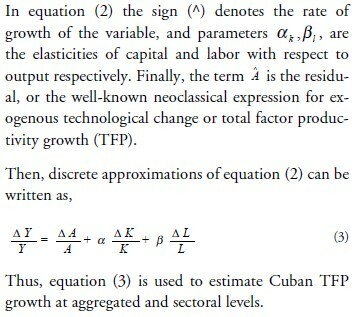 In addition, Cuban TFP results are used to draw some implications for growth models. This paper has four main goals. The first one is to provide a descriptive analysis of the historical pattern of Cuban factor accumulation (physical investment and human capital creation), social investment, and labor force structure. The second is to discuss the validity of TFP growth, estimated by using the traditional methodology (Solow, 1957), and to show that in the case of Cuba, those estimates are consistent with econometric estimations. The third goal is to find a theoretical explanation for decreasing TFP, through performing an analysis of technological change embodiment in capital and economies of scale analysis. The final goal is to analyze the applicability of linear growth models to the Cuban case. It is widely known that the importance of TFP changes over time. TFP growth measures the economic and technical efficiency of the process of transforming inputs or resources into products or final goods. The growth of an economy, or of a sector of an economy, is determined mainly by the rate of growth of its productive resources (especially labor and capital) and the rate of technological change or TFP growth. Thus, TFPs are important in explaining why some countries grow more rapidly than others, or why some specific industries or sectors grow faster than others for a given period of time.2 In addition, TFP is useful for the design of a country’s “catching up” process, which involves economic policies directed to exploit some industries’ or economic sectors’ comparative advantage, and to keep the country competitive internationally (Nishimizu and Robinson, 1984). Therefore, the differential rate of sectoral TFP growth is a crucial determinant of the comparative advantage that could help growth and define structural economic adjustments in the medium- to long-run for a specific country. The empirical literature on growth and technological change has accumulated a large body of “stylized facts” about the contribution of TFP and factors input (labor and capital) to economic performance.3 Most of the empirical studies of TFP show that increased investment and human capital are directly related with higher level of TFP.4 Theoretical linear endogenous growth models emphasize this relationship. Madrid-Aris (1997) showed that this relationship goes in the opposite way in Cuba. He also showed that Cuban economic growth during the period 1962-1988 was much like the Russian growth (Krugman, 1994)—it was mainly won by massive, often wasteful capital accumulation, rather than productivity growth. Cuba’s increased investment was possible thanks to the Soviet assistance/subsidies. Also, in the Cuban economy there were no positive correlations between investment in human capital (better-educated labor force) and TFP growth performance. Cuba had decreasing TFP while human and physical investment increased considerably over the same period. This paper is organized as follows. The first section provides a brief review of the historical patterns of Cuban growth, factor accumulation, and human capital for the period 1962-1988. The second section contains estimations of Cuba’s aggregate and sectoral rate of technical progress or total factor productivity (TFP) growth during the period 1962-1988, using two different methodologies—traditional methodology (Solow, 1957) and econometric methodology. The third section contains theoretical explanations of Cuban TFP growth results, such as technological change, embodiment in capital, and economies of scale analysis. The fourth section contains an endogenity analysis of Cuban investment using linear growth models, for the purpose of drawing some implications for their applicability to the Cuban case. The final section contains the conclusions. Table 1 shows a summary of Cuban main macroeconomic indicators and the Soviet assistance received by Cuba during the period 1960-1988. Cuba’s gross material product (GMP)5 was able to grow at a steady rate of 4.4% and per capita income increased at an average rate of 3.2% during this period. Cuba greatly increased the rate of investment, which went from 15% in 1960 to 30% in 1988. As the data in Table 1 show, between 1960 and 1964, there was no increase in income per capita. On the other hand, during the period 1965-1988 income per capita increased at a considerable rate. Data show that Soviet assistance increased considerably over time. During the period 1960-64, Soviet assistance was on average only 7% of GMP, but it increased to a level of 33% of GMP for the period 1980-1984. The amount of Soviet assistance was larger than the investments realized by the Cuban government for the period 1980-1984. In other words, during this period, it could be assumed that most of the investments realized by the Cuban government were realized by using capital coming from the Soviet Union.6 Therefore, it could be inferred that the Cuban economy was losing its saving capacity. Note that the highest rate of economic growth (10%) was achieved in the period 1970-1974. Ironically, during this period, the Cuban investment rate was low (17%) and even decreased, from 19% to 17%. Additionally, the lowest rate of economic growth (1.3%) was during the period 1985-1988, when the highest rate of investment (31%) was observed. Looking at these figures, it seems that the Cuban economy was not able to absorb in an efficient way such a high level of investment.7 If the rate of investment exceeds the country’s technical, human and institutional capacity to allocate it in an efficient way, most of the investment goes to poorly-managed projects. Hence, investment is not very productive and depreciates. In sum, it can be concluded that during the 1980s, investment was not allocated as efficiently as during the 1970s. Table 2 summarizes Cuban investment in education and health, and its percentage of total income. It shows that investment in education increased considerably. In 1960, it was only 3.2% of total national income, and increased to a level of 13.1% in 1987. Investment in health also increased considerably during this period. In 1990, investment in health represented only 2.0% of national income, and it increased to a level of 6.6% of national income by 1987. Table 3 summarizes Cuban infant mortality and population growth during the period 1960-1989. Cuban average rate of population growth in the 60s is 1.9%, in the 70s is 1.4%, and in the 80s is only 0.9%. These figures show the decreasing tendency of population growth in Cuba. At the same time that infant mortality was reduced considerable. The low rate of population growth could be explained by two factors: (1) the emigration of Cuban people to other countries; and (2) the reduction in the birth rate. Both elements indicate that Cuba presents the lowest population growth rate in Latin America. 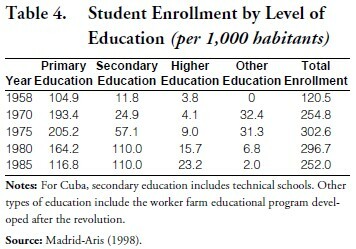 Cuba considerably increased the rate of enrollment during the period 1959-1988. Data from Table 4 show that human capital accumulation has been quite rapid in Cuba during the last 35 years. Without looking at economic variables such as the amount invested in education and the return on human capital creation, it could be concluded that the Cuban government was successful in achieving a very high rate of enrollment during this period. Centrally planned economies have an astonishing power to mobilize resources, especially labor. Hence, to understand growth in a centrally planned economy, it is essential to understand how the labor structure changes through time under this type of regime. Empirical evidence shows that in the Soviet Union, the rapid rate of economic growth achieved under communism, especially during the 1950s and 1960s,10 was mainly the result of the increased labor force and capital accumulation rather than of technological change.11 Table 5 shows the change in the labor force structure in Cuba from 1962 through 1988. Data in Table 5 show that the labor force increased considerably after the revolution. The labor force as percentage of total population surged from 15% in 1962 to 33% in 1988. Thus, over the past generation, the percentage of people entering the labor force doubled, but it obviously can not double again in the future.12 Large portions of this new labor force were women, which more than doubled from 1962 to 1988. The analysis of TFP presented in the coming section clearly shows that increased labor inputs are directly correlated with the Cuban economic growth. Harberger (1996, p.2) shows his preference for TFP estimates by using either the traditional growth-accounting methodology (Solow, 1957) or his two-deflator method instead of econometric estimation. It is clear that Harberger’s preference toward traditional methodology could not be extrapolated when estimating TFP growth for a centrally planned economy, since traditional methodology assumptions,14 especially perfect competition, is not be suitable to a centrally planned economy like Cuba. Thus, the validity (or lack) of each of these traditional assumptions affects the measurement of technical progress, and, therefore, its contribution to economic growth. Hence, under the absence of a multicollinearity problem, an econometric estimation of TFP could be a better way to estimate TFP growth as opposed to using traditional methodology. In this section, TFP using traditional methodology is estimated, and verified with econometric estimations. Results show that the TFP estimations using traditional methodology results are consistent with econometric results. Unfortunately, due to the lack of accurate and reliable data, it was not feasible to apply the two-deflator method to estimate TFP growth for Cuba. The starting point of growth accounting is the following aggregated production function. 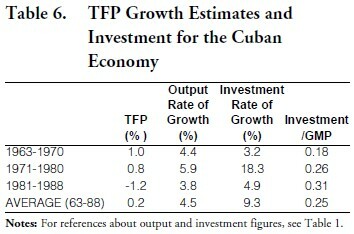 Total Factor Productivity (TFP) Growth and Investment for the Cuban Economy. Applying equation (3), and using the aggregate rate of growth of productive factors (labor and capital), the sectoral factor shares, and the stock of capital time series,16 TFP growth estimates are computed and presented in Table 6. Thus, the Cuban rate of technological change (TFPs) decreased over time, achieving negative values after 1980. On the other hand, Table 1 shows that investment increased considerably from 18% of GMP in the period 1963- 1970 to a level of 31% in the period 1981-1988. These results are contrary to what any economist would expect and to what endogenous growth models would predict. Empirical estimations of TFP from capitalist economies show that an increase of investment, human capital, and a lower rate of population growth leads to higher TFP growth (Barro, 1991).17 Hence, economists would have expected a higher rate of TFP growth for Cuban economy given the increasing investment in physical and human capital creation, but the Cuban economy shows opposite results. Based on previous work estimating TFP, the factors contributing to the aggregate economic growth are given in Table 7. Cuba’s average TFP contribution to economic growth for the period 1963-1988, is very low (only 2%). The average contribution of capital to economic growth is very high (70%). From these results, it could be concluded that Cuba’s economic growth has been basically driven by increased investment. In addition, Cuba’s economic growth during the period 1975-1988 is directly linked to the increased level of Soviet subsidies, which allowed the Cuban economy to achieve the high rate of investment observed during this period. In sum, the TFP growth results show that Cuba was not able to take advantage of the investment in human capital to gain some economic efficiency, especially during the 1980s. Results from Table 7 suggest that Cuban central planning policy, and especially the New System of Economic Management and Planning (SDPE),18 failed to achieve technological change. Note that the implementation of SDPE could have led to an even lower rate of growth of technological change. This failure is even confirmed by Cuban officials who recognized the inefficiency of this plan (Zimbalist and Eckstein, 1987). It seems that Cuba’s low rate of technical progress may simply be due to over-investment and to the absence of competitive pressure and economic incentives that provides motivation to maximize profits. The Cuban case of low contribution of TFP to economic growth seems to be a common pattern of the ex-socialist economies. Nishimizu and Robinson (1984) found that in Yugoslavia, almost all the industries derived their growth from increases in factors inputs, with zero or negative contribution from TFP growth. Bergson (1983) found that most of the Soviet growth was based on rapid growth in inputs (labor and capital). Reality shows that Stalinist planners—as Castro’s planners also did—moved millions of workers, especially women, into the labor force. These research results confirm Krugman’s statement, in that the special strength of Soviet economies (centrally planned economies) was their ability to mobilize resources (especially labor), not their ability to use them efficiently (Krugman, 1994, p. 69). The sectoral analysis included only agriculture and industry, since under the Soviet national accounting system, the total output of productive sectors is only aggregated into six categories (industry, agriculture, construction, transportation, communications, and commerce). Note that these two sectors represented more than two thirds of the total GMP. Total Factor Productivity and Investment for the Agricultural Sector: Applying equation (3) and using the rate of growth of agricultural productive factors (labor and capital) and the sectoral factor shares, yields TFP estimates in Table 8. They show that the agricultural sector experienced negative growth of TFP for the period 1963-1988. Therefore, it could be assumed that resources invested (especially capital) were not used efficiently in this economic sector. In sum, Cuban agricultural output growth was basically driven by expansion of inputs, especially investment, during the period 1963-1988. Note that the average investment rate (1963-1988) in the agricultural sector was extremely high (37%). It was three times higher than the industrial average investment rate (12%). Again, the only possible explanation is that most of the agricultural output was the result of increased investment, as result of increased Soviet subsidies given to Cuba during this period. It seems fair to say that the negative agricultural TFP reflects the low level of yields of Cuban agriculture.19 It is also possible to conclude that the Cuban centrally planned agricultural economic policies were inefficient in their attempt to force some technological change during the period 1963-1988. In sum, Cuba was not able to take advantage of the large amount of resources invested, especially in human capital creation. The large investment destined to human capital creation, complemented with the high level of investment in physical capital, could have led to an increase in TFP growth, thus leading to an increase of agricultural output, but the results are opposite. Total Factor Productivity Growth and Investment for the Industrial Sector: It is important to note that under the Cuban accounting system, the industrial sector includes several industries20 (e.g., mining, electrical energy, oil, fuels, electrical machinery, chemicals, paper products, wood products, construction products, food, textiles, glass, etc.) which under the Western accounting system are classified by different SIC codes under many subcategories (e.g., light manufacturing, heavy manufacturing, mining, and services such as utilities). Applying equation (3) and using the rate of growth of industrial productive factors (labor and capital), the sectoral factor shares, and the stock of capital of the industrial sector, the industrial TFP growth estimates are given in Table 9. Industrial TFP growth achieved was moderate (0.6%) for the period of 1963-1980, but negative (-0.4%) for the period 1981-1988. Evidence provided in this paper shows that the average ratio of investment to output in the industrial sector was very low (12%) compared with the agricultural sector (37%). Industrial and agricultural TFP results from this research and investment data suggest that the right level of investment, and avoiding over-investment, could make people more productive, thus achieving higher rates of technological change. Summary of Factors Contributing to Economic Growth: Previous results show that the industrial sector, which had a lower rate of investment, had the higher TFP growth. Thus, for a better understanding of Cuban economic growth and its linkage with input factors (labor and capital), the factors contributing to economic growth have been estimated in Tables 10 and 11. Previous tables show that for the agricultural sector, the average TFP growth is negative (-1.5), and its contribution of TFP to output is negative (-23%) during the period of 1963-1988. In the industrial sector, at least the average TFP growth positive, but it was moderate (0.6), and its contribution to economic growth was very low (7%). In sum, the Cuban governments’ interventionist policy during 1975-1988 was accompanied by very low TFP performance, especially in agriculture. Thus, the creation by governments of institutional mechanisms to deal with inefficiencies may not always be an efficient way to force technological change. It seems very difficult to understand why the massive investments in physical and human capital led to such a low TFP in the 1970s and 1980s, but it seems a common pattern of centrally planned economies. With the purpose of avoiding the criticism about the use of traditional growth accounting methodology to estimate TFP growth in a centrally planned economy, where the strong assumption of perfect competition does not hold, TFP was estimated using econometric methodology, and compared with previous results. Results obtained in this section show that results obtained under the two methodologies are consistent. Growth accounting can be conducted by subtracting from the residual the contribution stemming from increases of inputs (especially human capital), as well as the contribution from research and development. For the purpose of comparison with previous TFP estimates where human capital adjustment was not considered, in this section TFP was estimated without considering human capital quality adjustment. In other words, quality of labor is considered constant through time. In general, when TFPs are estimated econometrically, it is convenient to keep the assumption of constant returns to scale (CRTS) because it reduces the number of independent parameters to be estimated, and thereby, mitigates the possible multicollinearity among the data on capital and labor inputs and time (Boskin and Lau, 1992). From this paper analysis of economies of scale, it seems reasonable to keep the assumption of CRTS, especially for the Cuban economy and industrial sector. The right way of estimating technical progress econometrically is by including in the production function a term (terms) to capture the effect of technical progress through time, in order to allow technical progress to be non-linear over time. Thus, the Hicks neutral equation (11) was estimated econometrically. Applying natural log to equation (4), leads to equation (6). Econometric estimation of equation (6’) leads to the results in Table 12. The capital elasticity with respect to output obtained (0.47) for the Cuban economy, as a whole, is very close to that obtained indirectly using national accounts (0.51) and used in the indirect estimation of the TFP. The average rate of technical progress during the period 1962-1988, obtained econometrically for the Cuban economy as a whole, is equal to 0.4, which is very close to that obtained using indirect methodology (0.2). Therefore, results in Table 12 confirm the validity of TFP obtained in the previous section for the Cuban economy as a whole. Econometric estimations of TFP for the agricultural sector over the period 1962-1988 are much lower (- 4.2%) than those obtained indirectly (-1.5%). This difference could be explained by the fact that the agricultural sector does not present constant return to scale. But, the main issue is that in both cases, agriculture presented a negative growth of TFP during the period 1962-1988. The aggregated rates of depreciation used to determine the stock of capital time series, and therefore the TFP previously determined, was equal to 4.5%, which could be low. Thus, there could exist the possibility that Cuban depreciation estimates are inappropriate for an economy which experienced structural change. A higher depreciation rate implies that the capital stock accumulates more slowly, thus higher technological change can be observed. To test the effect of endogenous depreciation, TFPs were estimated using the methodology previously explained (equation 3), but using new stock of capital time series, which were constructed by increasing the depreciation rate to a level of 10% and 20%, respectively. Tables 13 and 14 show the new TFPs estimated and their contribution to economic growth. The results show that increasing the rate of depreciation does not change the TFP patterns much or TFPs’ contribution to economic growth as a whole. It seems that depreciation has some effect in the industrial sectors, since TFP contribution to economic growth increased from 7% to 23%. It is difficult to believe that depreciation rates could be higher than 20%. Hence, the upper bound or “best scenario” would be that Cuban technological change contributed only 9% to the total output (Table 14). In sum, an endogenous rate of depreciation does not provide explanation about the low-level TFP growth during the period of 1963-1988 in Cuba. Applying ordinary least square (OLS) to equation (5) and using time series data for the period 1962-1988, the results in Table 15 are obtained. Note that econometric estimation of equation (5) could lead to a multicollinearity problem (Boskin and Lau, 1992; Harberger 1996). Our data base was tested for multicollinearity problems without finding serious problems. 23 On the other hand, the null hypothesis of the existence of CRTS for the industrial sector, and the Cuban economy as a whole, would not be rejected.24 Previous results show the presence of CRTS in the whole economy and industrial sector. It is important to note that the agricultural sector, where most of the investment was allocated, shows decreasing return to scale. Therefore, diminishing returns could be explained by the clear over-investment in this sector. Investment in agriculture was 48% of GMP in the period 1981-1988 (see Table 8). In sum, economies of scale results obtained in this section provide at best, a partial explanation for the decreasing and low TFP growth found in the agricultural sector. Economies of scale analysis do not provide many answers to the decreasing TFP found in the Cuban industrial sector and in the economy as a whole. Regression results from Table 16 provides mixed results. Obviously, reality suggests that Cuban investment was realized exogenously in all economic sectors, since Cuban capital accumulation was mainly forced by governmental interventionist policies. There is doubt about Cuban investment exogenity, since Young (1992) argues that in Singapore, with a less interventionist government, the capital stock is considered to be increased exogenously. Results from Table 16 show that only the agricultural sector presents a lower coefficient (0.28) than the income share coefficient, which is equal to 0.5. Thus, this results would not favor linear growth models. One can argue that capital stock increased exogenously in this economic sector. Obviously, exogenity in capital accumulation in the agricultural sector could have been a consequence of government interventionist policies which can be considered as exogenous. But, on the other hand, it is important to note that agricultural data presents some multicollinearity problems, and also the regression correlation factor is low (0.44), therefore, the agricultural coefficient should be taken with caution. The high coefficient of the industrial sector (0.92) is evidence in favor of linear models. Thus, in the industrial sector, capital stock could have increased endogenously. In this case, Cuban interventionist policies should be lower in this sector compared with the agricultural sector. Reality seems to validate this result, because investment in the industrial sector was much lower than that of the agricultural sector, therefore, it could assume there were less interventionist policies in this sector. On the other hand, the industrial sector was able to achieve positive TFP growth under a presence of a much lower level of investment. This suggests that industrial less exogenous investment was more efficiently allocated than the exogenous agricultural investment. The industrial sector regression result complemented with the agricultural sector results seems to suggest that linear models could explain level of endogenity of capital accumulation across sectoral levels within the country context. The result for Cuba, as a whole, makes even more difficult to draw some conclusions regarding linear growth models, since regression results does not favor linear growth models because the coefficient on capital (0.56) is very close to the capital share of national income (0.51). These results seem to support Young’s conclusions. From Singapore’s evidence and cross-countries analysis, Young concludes that the constancy of capitaloutput ratio and large coefficient on capital in crossnational and country-specific regressions (Young, 1992, p. 48-49), are due to endogenous response to capital accumulation to technical change, within the context of an otherwise concave production function. Then, he concludes that simple linear endogenous growth models is not a useful means of thinking about the growth process (Young, 1992, p. 50 and p.60). Looking at Young’s results and from the present study results, the question to be addressed should be: Do the Cuban aggregated and sectoral results support or not Young’s conclusions about linear growth models? Since results from the present research are mixed, there is not a unique answer. Some feasible explanation from this study and Young’s (1992) research is that the use of “linear models” is not a very good tool for explaining growth in economies with a very high rate of investment. Therefore, maybe linear models should be limited to non-interventionist economies, and where investment is not force by governmental interventionist policies. However, from this analysis, it seems that linear models can provide some insight at sectoral levels regarding level of endogenity investment within the country. Obviously, much more empirical research is needed to support this conclusion. TFP analysis results show that Cuba’s growth during 1963-1988 was almost entirely the result of capital accumulation rather than productivity gains. Decreasing TFP growth through the 1970s and 1980s, with increasing amount of subsidies received from Soviet Union during the same period, seem to suggest that Soviet dependency created inefficiency in Cuba. Conclusions from the theoretical analysis of TFP could be summarized as follows: (1) Increasing the rate of depreciation does not change the TFP patterns much or TFPs’ contribution to economic growth as a whole. In sum, an endogenous rate of depreciation or technological change embodiment in capital does not provide an explanation for the lowlevel TFP growth during the period of 1963-1988 in Cuba; (2) The agricultural sector where most of the investment was allocated shows decreasing return to scale. Diminishing return could be explained by the over-investment in this sector, which was forced by poor investment planning policies. Therefore, economies of scale results provide at best, a partial explanation for the decreasing and low TFP growth found in the agricultural sector. Economies of scale do not provide answers to the decreasing TFP found in the Cuban industrial sector and in the economy as a whole. Results show that Cuba’s case is very different from that of most economies. The results show that theoretical endogenous growth models could not easily explain Cuba’s economic performance. In Cuba’s case, an increase of capital stock and human capital occurred at the same time as a decrease in the rate of technological change. Cuba’s unique case could be partially explained by several factors, principal among them is the extreme inefficiency of the centrally planned investment policy in allocating resources (especially in human capital creation), which led to an over investment and decreasing TFP. The over investment in agricultural sector led to decreasing returns to scale. From this research, it seems that the use of linear growth models for explaining the process of economic growth under an exogenous investment may be limited. Hence, in cases where there is over-investment, such as the Cuban case, linear growth models may not be an appropriate tool to explain the process of economic growth. TFP and investment evidence from industrial and agricultural analysis, seems to suggest that there is an optimal level of investment that maximizes technological change. It seems that the optimal level should be directly related to the country’s technical capacity (infrastructure, level of technology, research capacity, etc. ), human capital, the efficiency of its institutions and markets. Investment over the optimal level, lead to inefficiency in investment allocation, and to a reduction in the rate of technological change. In sum, one important conclusion resulting from this study is that under a centrally planning resource allocation system (as the Cuban case), more investment does not lead to an increase in the capital efficiency factor, and could actually lead to diminishing returns to scale. Thus, under an over-investment condition, such as the Cuban case, linear growth models should be used with caution, since they may not be an appropriate tool for explaining the process of economic growth. In addition, sectoral results from this research seems to suggest that linear growth models can provide some insight at sectoral levels regarding different levels of endogenity investment within the country. Further studies of economies with high rate of investment, and contrasting similar pattern and institutions could help to our understanding of the role of over investment, human capital accumulation and economic growth, in centrally planned economies and the applicability of linear growth models. 1. I would like to express my deepest appreciation to the people who helped me in Cuba to find and collect some of the data which were used in this research. The author wishes to acknowledge the helpful comments received from Jeffrey Nugent, Caroline Betts, Ernesto Hernández-Catá, Matt Nussbaum and Borislav Arabajiev. The views expressed, opinions, and conclusions reached in this paper are those of the author, and do not necessarily reflect those of the institutions with which the author is affiliated. 2. For an interesting comparative cross-country research on total factor productivity (TFP), which includes Korea, Japan, Turkey, and Yugoslavia, see Nishimizu and Robinson, 1984. 3. For a critical survey about TFP, see Nelson (1981). For case studies applied to less developed countries (LDCs), see Teitel and Westphal (1984) and Solimano (1996). 4. Singapore is an exception (Young, 1992). 5. The Cuban accounting system is different from the western concept of Gross National Product (GNP). Cuba uses the Soviet system of Global Social Product (GSP) and Gross Material Product (GMP), which is also called “gross product.” For further explanation of the Cuban Accounting System, see Brundenius (1984), pp. 19-40, Mesa-Lago and Pérez-López (1985), Madrid-Aris (1998). 6. Note that in a centrally planned economy like Cuba, the investment is mainly realized by the government since there are no opportunities for private enterprises or for private investment. Therefore, private income is spent mostly in consumption. 7. Miguel Figueras, the former Director of Planning of the Cuban Ministry of Industry, supports this view. For further details, see Figueras, 1994. 8. Human capital investment is a concept widely used by economists, meaning the process of improving of the quality of the labor force. Thus, human capital is referred to as the level of education of the labor force. This improvement of the labor force quality is basically achieved by education and training (Becker, 1963). 9. This approximation is assumed due to the lack of accurate and reliable data about graduation rates and their relation to the labor force. 10. The average growth rate of the Soviet Union during 1950-1964 was 4.3%. The growth rate of the U.S. was only 2.2% for this period. For further details, see Bergson (1968). 11. For further detail, see Krugman (1994) and Poznanski (1985). 12. Labor force as percentage of total population can not double again because today the labor force is already 33% of the total population. Doubling this figure means that 66% of the population would be part of the labor force. In reality this is not feasible, because to achieve that rate, it would mean that most of the women, old men, and children would have to be a part of the labor force. 13. For further details about Harberger’s criticism of econometric estimation of TFP, see Harberger (1990, 1996). For an explanation of his two-deflator method, see Harberger (1998). For an application of the two-deflator method to Mexico’s manufacturing sector, see Torres (1997). 14. The traditional assumptions are profit maximization with competitive labor and output markets (perfect competition), and constant returns to scale (CRTS), which implies that firms will set the return on capital equal to marginal product of the capital. 15. For a detailed review of neoclassical growth models, see Sala-i-Martin (1990). 16. For further explanation about the methodology used to built the stock of capital time series, see, Madrid-Aris (1997, 1998). 17. An exception is Young (1992, 1994). Young found similar productivity patterns for Singapore. 18. The New System of Economic Management and Planning (SDPE) was introduced in the second half of the 1970s. It was modeled on Soviet economic reforms. This management system had different goals, among those: (1) to force enterprises on a self-financing basis; (2) to increase incentives to achieve a better rate of growth of productivity; and (3) to promote decentralization, organizational coherence, and efficiency (Zimbalist and Eckstein, 1987). 19. During the last 40 years, the Cuban agricultural yields increased at a lower rate than the world average. Today, Cuba’s average yields are less than 50% of those of developed economies. For further details, see Figueras (1994) and Food and Agriculture Organization (1969, 1990). 20. For further details, see Anuario Estadístico de Cuba (industrial production). 21. For examples, see Solow (1959, 1962). For a formal model of technical progress embodied in capital, see Hulten (1992). 22. After the revolution, a large amount of equipment and investment was mainly destined to mechanize the agricultural sector and to create an industrial base. Investment went to the development of new industries and expansion of existing industries, such as cement, fertilizers, electrical, and mining among others, which created a structural transformation of the Cuban economy, especially in the industrial sector. For further details, see Figueras (1994), pp. 96-111 and Madrid-Aris (1998). 23. A Belsley, Kuh, and Welch (1980) test of multicollinearity was conducted. In the Cuban economy as a whole, and the agricultural sector, there are no multicollinearity problems at all. The only regression that presents some multicollinearity problems is the agricultural sector. 24. Hypotheses is not rejected at 95% confidence level. 25. 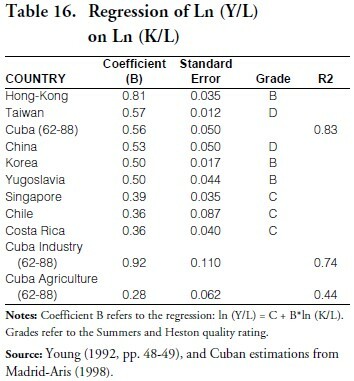 Cuban results were obtained using the author’s database.